Cable MSO Liberty Global is to acquire Dutch cable operator Ziggo in a stock and cash transaction valuing Ziggo at approximately €10 billion. In addition, Liberty Global also announced that its Board of Directors has approved a stock dividend of one Liberty Global Class C ordinary share on each outstanding Class A, Class B and Class C ordinary share as of the record date for the stock dividend. It is expected that this stock dividend will be issued on March 3rd 2014. Under the terms of the Offer and adjusting for completion of the stock dividend, Ziggo shareholders will receive €11.00 in cash, 0.2282 Liberty Global Class A ordinary shares and 0.5630 Liberty Global Class C ordinary shares (0.1674 prior to completion of the stock dividend) for each Ziggo share that they hold (the “Offer Price”). The offer represents a 38 per cent premium to the closing share price of Ziggo of €25.85 on March 18th 2013, the day before the previous private equity shareholders executed an equity sale that preceded Liberty Global’s acquisition of its initial stake in Ziggo and a premium of 22 per cent to the closing share price of Ziggo of €29.24 on October 15th 2013, the day before Ziggo announced it had received a preliminary proposal regarding a potential offer for the company by Liberty Global. In addition, Ziggo has agreed not to pay or declare any (interim) dividend or to make any distribution in kind until completion of the transaction. • Reaching 7 million or over 90 per cent of Dutch homes, the combined business will provide approximately 10 million video, broadband internet and telephony services to over 4 million unique customers through a fibre-rich cable network. With approximately €2.5 billion in total revenue, the combined company will be a leading provider of communication services across the Netherlands. • Creates leading challenger in the mobile and enterprise businesses with the emergence of a nationwide cable operator, further ensuring sustainable competition throughout the Netherlands, benefiting the Dutch economy and society as a whole. • Continued investment and innovation to benefit Dutch consumers, as our increased scale will drive efficiencies and enhance our ability to invest in the development of cutting-edge products and services. • Planning to leverage Ziggo’s strong brand nationwide and capitalize on the deep bench of talented professionals at both companies, the new entity is well-positioned to deliver operational excellence with best-in-class customer service. • Centralising Dutch operations at Ziggo’s Utrecht headquarters, which will be fully-equipped to serve the new combined company and benefit from being part of the wider Liberty Global group. • Significant synergy opportunities as a result of scale advantages across core functional areas and leveraging Liberty Global’s pan-European platform, procurement and integration expertise. • Unanimously recommended by Ziggo’s Supervisory and Management Boards, having concluded the transaction is in the best interests of Ziggo and its stakeholders (including its shareholders). The Offer is expected to close in the second half of 2014. Liberty Global will fund the acquisition with a combination of shares and cash. The total consideration required to purchase the remaining shares is approximately €4.9 billion. Of the total consideration, the stock component equates to €3.4 billion and the cash component equates to €1.6 billion, which excludes transaction and other costs. After careful consideration, the Management Board and Supervisory Board of Ziggo believe the Offer to be in the best interests of Ziggo and its stakeholders, including its shareholders, and have agreed to fully and unanimously support and recommend the Offer for acceptance to Ziggo’s shareholders. Furthermore, the individual members of the Boards will tender all of their shares under the Offer. 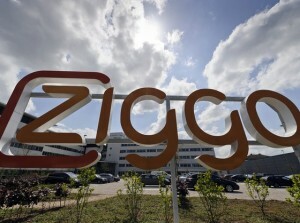 Liberty Global and Ziggo anticipate that full integration of Ziggo and the UPC Netherlands business will deliver substantial operational, commercial, organizational and financial benefits, which could not, or only partially, be achieved if Ziggo were to continue as a standalone entity with a minority shareholder base.